Written by Glen Knight (demazter) as part of a series of how-to articles. One of the biggest consumers of disk space with Small Business Server 2008(SBS) is Windows Server Update Services, more affectionately known as WSUS. 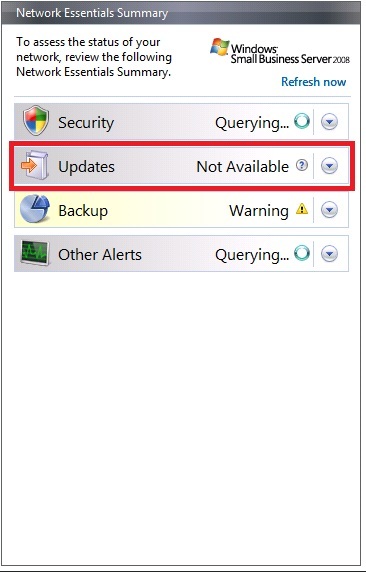 For those of you that don’t know what this is, it provides Windows Updates to both the SBS server and all the client machines when correctly joined to the SBS Domain. Coupled together with Microsoft Updates (discussed in my article here: http://www.experts-exchange.com/OS/Microsoft_Operating_Systems/Windows/Windows_7/A_3236-Get-more-from-Windows-Updates.html ) this can be a very effective method of keeping your network of Microsoft products up to date. Fear not, we can simply move the WSUS Data to a different drive so it is no longer clogging up valuable space on the System Drive. Where ever possible with Small Business Server we should always use the wizards to make changes to the system. The majority of these are located in the SBS Console. The wizard for moving the WSUS data is no different. 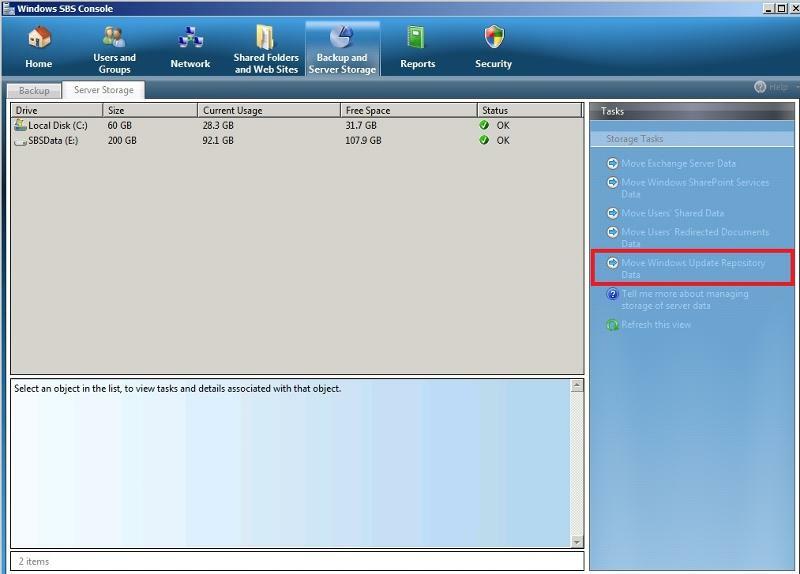 In the SBS Console click on the Backup and Server Storage icon across the top of the console and you will be presented with the screen below. In the tasks pane on the right hand side click on Move Windows Update Repository Data this will start the wizard. You then simply select the new location for the data and complete the wizard. Once done, your WSUS data will no longer be taking up valuable space on your system drive.